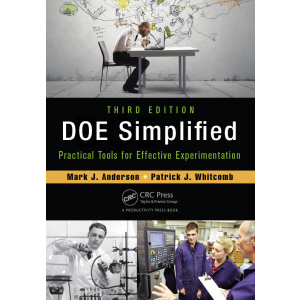 [:en]Our principal Stat-Ease Inc. is happy to announce the publication of DOE Simplified, 3rd Edition, coauthored by Mark Anderson and Pat Whitcomb and published by Productivity Press. This new edition has been updated throughout and includes a whole new chapter on factorial split plots for handling hard-to-change factors. It is now also available in e-book format, which is a great option for e-readers or when shipping costs are prohibitive. The book ties in with version 9 of Design-Expert® software. Readers can freely download a trial of the software for use while working through the practice problems. Although it’s intended for self-study by industrial experimenters, DOE Simplified, 3rd Edition also works well for computer-intensive courses and workshops. It can be purchased in paperback or e-book format from the publisher or via Amazon and other major booksellers. It is also available from Stat-Ease (in paperback). If you are looking for a fun, practical guide to learning DOE, this book is for you!